A NEW YORK TIMES BESTSELLER From a renowned behavioral neuroscientist and recovering addict, a rare page-turning work of science that draws on personal insights to reveal how drugs work, the dangerous hold they can take on the brain, and the surprising way to combat today's epidemic of addiction. Judith Grisel was a daily drug user and college dropout when she began to consider that her addiction might have a cure, one that she herself could perhaps discover by studying the brain. 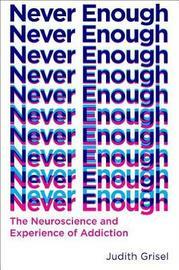 Now, after twenty-five years as a neuroscientist, she shares what she and other scientists have learned about addiction, enriched by captivating glimpses of her personal journey. In Never Enough, Grisel reveals the unfortunate bottom line of all regular drug use: there is no such thing as a free lunch. All drugs act on the brain in a way that diminishes their enjoyable effects and creates unpleasant ones with repeated use. Yet they have their appeal, and Grisel draws on anecdotes both comic and tragic from her own days of using as she limns the science behind the love of various drugs, from marijuana to alcohol, opiates to psychedelics, speed to spice. With more than one in five people over the age of fourteen addicted, drug abuse has been called the most formidable health problem worldwide, and Grisel delves with compassion into the science of this scourge. She points to what is different about the brains of addicts even before they first pick up a drink or drug, highlights the changes that take place in the brain and behavior as a result of chronic using, and shares the surprising hidden gifts of personality that addiction can expose. She describes what drove her to addiction, what helped her recover, and her belief that a "cure" for addiction will not be found in our individual brains but in the way we interact with our communities. Set apart by its color, candor, and bell-clear writing, Never Enough is a revelatory look at the roles drugs play in all of our lives and offers crucial new insight into how we can solve the epidemic of abuse.